Ryley told me he wanted a chocolate cake with chocolate frosting for his birthday. How simple! Finally, a child with a non-crazy birthday cake request. Last year’s Tardis cake was tricky enough. Maybe Ryley was finally moving beyond having geek-culture inspired cakes now that he’s getting deeper into his teens. Nope. On the morning of his birthday, I mentioned how I’d bake his chocolate cake while he was at school. He said something about having Steve on his cake. Please? If you don’t know who Steve is, then you probably never heard of Minecraft. If you’ve never heard of Minecraft, where have you been? I contemplated Ryley’s cake and how to combine Steve and chocolate quickly and easily. I thought I’d try to make fondant squares and make Steve’s pixelated face, but I quickly nixed the idea when I recalled I do not know how to make fondant. So, I poked around looking at Minecraft junk and found these templates for 3D paper figurines. It was decided. I’d print the templates on heavy paper, cut them out, glue them together, and perch them on the still-to-be-made cake! And then I thought about the shape of the cake. EVERYTHING in Minecraft world is a cube or square. I couldn’t make a round cake. After mixing the batter (I used this recipe, which was FABULOUS), I poured it into two pans. One was a small square, one was a small rectangle. I baked them and nearly averted disaster when they overflowed a bit in the oven. I started formulating Cake Plan B, but decided to give them a few more minutes of cook time, which worked. Once I took them out of the oven, they settled and all was well. After cooling, I placed the square cake on a stand and frosted it with chocolate frosting. Then I put the rectangle cake on top and frosted that so it was tiered. 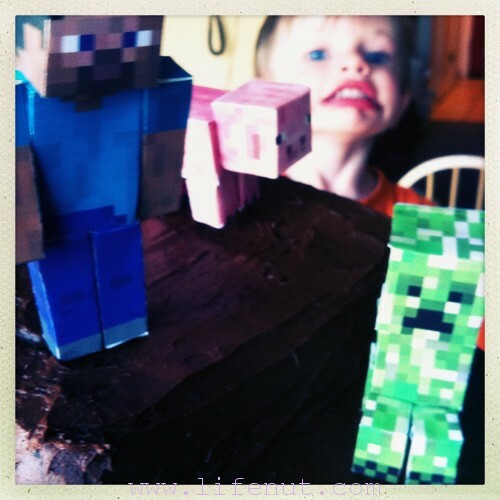 In between mixing, baking, cooling, and frosting, I made Steve, A Creeper, and a pig using the templates I printed. It took a long time to make the paper figurines because of the meticulous cutting, folding, gluing, and then assembling. I poked a toothpick into a foot on each of the figurines and stuck it in the cake. I didn’t want frosting to get on them, so they’re actually floating slightly above the frosting. Somehow, I managed to keep the cake a surprise until we were ready to sing happy birthday to him. The look on his face made all the work worth it: The glue stuck to my fingers! The eye strain! The gobs of frosting I consumed to make sure it was high quality! I’m really pleased with how it turned out because he was so happy. Wonderful – my boys would LOVE that cake! That looks awesome. You’re such a great mom! I’m very impressed. Well done! How did the candle blowing go. Wish we had been there. Your kids are going to expect even greater creations in the future! Your son obviously loved it, good job! 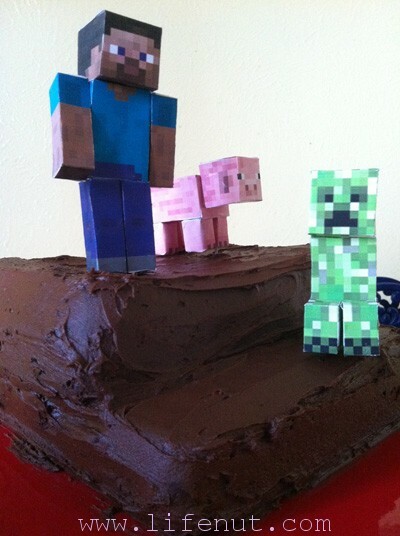 I’m heading into minecraft cake creation world myself and am using those printables for the figures too. Thank you for posting this!!! This is exactly what I was looking for!!!! 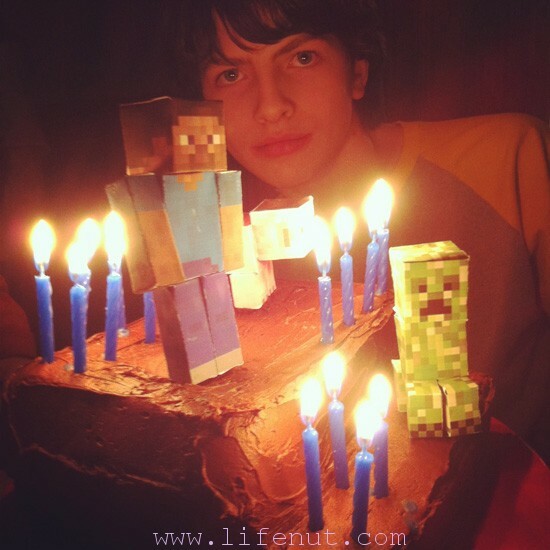 That’s fun and different from the typical minecraft cake! thanks for the great idea.